Metal-rich stars accumulate their metals from previous generations of stars, and so contain the history of their galaxy. By studying these stars we can gain valuable insights into how metals change the formation and evolution of stars, and explain the extraordinary massive star populations observed in the metal-rich region of our own galaxy. Observations of metal-rich regions have shown that stars hosting giant planets are generally metal-rich, which has triggered further observations of metal-rich stars. This has led to the discovery of new exoplanets, and advances in the study of planet formation and the late chemical evolution of galaxies. 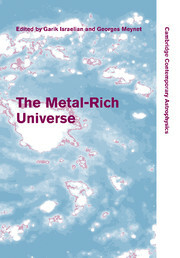 This book covers many aspects, from spectral line formation to stellar formation and evolution in high metallicity regimes. It is invaluable to researchers and graduate students in stellar evolution, extragalactic astronomy, and planet formation. 6. Metal-rich massive stars - how metal-rich are they? 33. Are WNL stars tracers of high metallicity?